The Young and the Restless (Y&R) spoilers for Thursday, November 16, tease that Chelsea (Melissa Claire Egan) will offer Jordan (Darnell Kirkwood) a warning. She’ll contend that he’d better get out of town while he still can. Chelsea will feel certain that Hilary’s (Mishael Morgan) going to cause more trouble for both of them. If Jordan leaves now, he could save himself. However, Jordan will insist on sticking around. He’ll worry that this mess could get even worse if he can’t keep Hilary in line. Jordan doesn’t want his past to follow him the next city he lands in, which could happen if Hilary makes enough noise. Y&R spoilers say Jordan will vow to support Chelsea and keep their situation contained if possible. Unfortunately, that’s wishful thinking since Hilary’s involved. She’ll call Mariah (Camryn Grimes) to the TV studio for a real bombshell. The Young and the Restless spoilers state that Mariah will wonder what’s up. Hilary never keeps her in the loop voluntarily, so Mariah has to pry whatever info she can get out of her. Mariah will push her cohost to spill what’s happening and Hilary will admit that there’s breaking news. She’s got the dirty details of Jordan and Chelsea’s connection, so it’s time to share what she knows with the people of Genoa City. Hilary will be ready to score big ratings and make her enemies suffer in the process. Other Young and the Restless spoilers say Paul (Doug Davidson) will follow up on a few leads. He’ll eventually realize that Dina (Marla Adams) could be of assistance. She was found in the area where Scott (Daniel Hall) and Abby (Melissa Ordway) are being held hostage. Paul will undoubtedly grill Dina to see if she can remember anything. It’ll be a struggle for her, but she’ll probably come through for the cops. 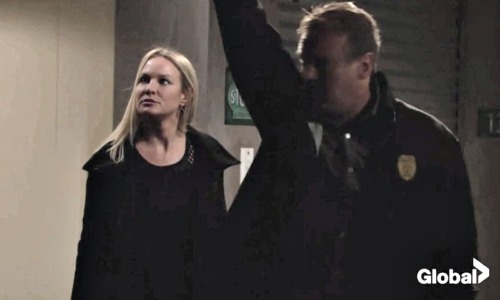 Later, Sharon (Sharon Case) and Paul will arrive at the storage locker. They’ll quickly open it up, but they may be surprised by what they see inside. Scott and Abby indulge in a make-out session on Wednesday, so will they still be too close for comfort on Thursday? Will Y&R force Scott and Abby to keep their kisses a secret instead? At least they’ll be rescued! That’s the important thing in all of this. We’ll give you updates as other details emerge. Stick with the CBS soap and don’t forget to check CDL often for the latest Young and the Restless spoilers, updates and news.